Second, the book is premature. 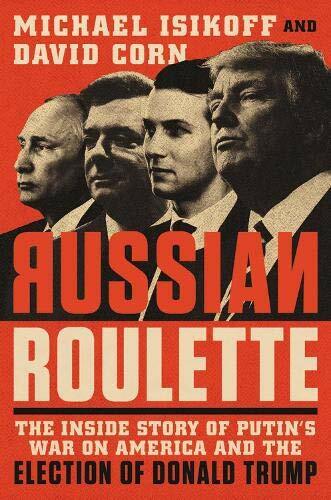 Insofar as there really is a great conspiratorial story to be fully uncovered about Putin, Trump, and the 2016 election, it will be told by special prosecutor Robert Mueller’s federal investigation, which is still ongoing. Third, Isikoff and Corn refer to Putin’s alleged subversion of something that doesn’t really exist: “American democracy.” Saying that Russia has undermined “American democracy” is like this reviewer—middle-aged, five-foot nine, and unblessed with jumping ability—saying that the Brooklyn Nets’ Russian-born center Timofy Mozgov undermined my potential career in the National Basketball Association. University of Kentucky history department chair Ronald Formisano’s latest book is quite properly titled American Oligarchy: The Permanence of the Political Class (University of Illinois, 2017). As Formisano shows, U.S. politics and policy are under the control of a “permanent political class”—a “networked layer of high-income people” including Congressional representatives (half of whom are millionaires), elected officials, campaign funders, lobbyists, consultants, appointed bureaucrats, pollsters, television celebrity journalists, university presidents, and executives at well-funded nonprofit institutions. This “permanent political class,” Formisano notes, is taking the nation “beyond [mere] plutocracy” to “the hegemony of an aristocracy of inherited wealth.” It “drives economic and political inequality not only with the policies it has constructed over the past four decades, such as federal and state tax systems rigged to favor corporations and the wealthy; it also increases inequality by its self-dealing, acquisitive behavior as it enables, emulates, and enmeshes itself with the wealthiest One Percent and .01 percent . . . [and]contributes to continuing high levels of poverty and disadvantage for millions that exceed almost all advanced nations.” This “permanent political class” (PPC) and the “aristocracy of wealth” it attends to and apes is a product of U.S. history and U.S. state capitalism. It has nothing to do with Russia. Majority opinion is regularly trumped by a deadly complex of forces in the U.S.: the campaign finance, candidate-selection, lobbying, and policy agenda-setting power of wealthy individuals, corporations, and interest groups; the special primary election influence of full-time party activists; the disproportionately affluent, white, and older composition of the active (voting) electorate; the manipulation of voter turnout; the widespread dissemination of “distracting, confusing, misleading, and just plain false information;” absurdly and explicitly unrepresentative political institutions like the Electoral College, the unelected Supreme Court, the over-representation of the predominantly white rural population in the U.S. Senate; one-party rule in the House of “Representatives”; the fragmentation of authority in government; and corporate ownership of the reigning media, which frames current events in accord with the wishes and world view of the nation’s real owners, who are wealthy U.S. oligarchs, not Russian ones. Fourth, Isikoff and Corn leave out much of the inside story behind Trump’s election. A multiplicity of factors besides Russian/Putin’s involvement led to Hillary Clinton’s defeat and Donald Trump’s victory: the dismal centrist awfulness, strategic failures, and related policy silence of Mrs. Clinton’s big money and establishment campaign; the remarkable free media attention Trump received; the anti-establishment “populist” mood of an electorate still climbing out a horrific Wall Street-imposed Great Recession and struggling with the weak, low-wage “Obama recovery”; the demobilization of much of the Democrats’ usual base by the neoliberal Obama presidency; racist voter suppression in key Republican-controlled battleground states; the remarkable influx of campaign cash Trump received from right-wing U.S. billionaires and equity capitalists (American, not Russian oligarchs like Sheldon Adelson and Robert Merver) in the late summer and fall of 2016; FBI Director James Comey’s last-minute revelation that Hillary Clinton’s private email server was once again a subject of federal investigation; the remarkable network of homegrown media and cyber-politics developed by the U.S. right-wing on its own, with no help required from Russia. It seems likely that Russia’s interference was a relatively minor factor by comparison with of all these other factors. President Bill Clinton’s decision to annul a 1990 agreement with Moscow not to push North Atlantic Treaty Organization further east after the reunification of Germany and not to recruit Eastern European states that had been part of the Soviet-ruled Warsaw Pact. NATO’s decision to renege on its 1997 pledge not to install “permanent” and “significant” military forces in former Soviet bloc nations. NATO’s decision two years ago to place four battalions on and near the Russian border. President George W. Bush’s unilateral withdrawal from the Anti-Ballistic Missile Treaty. President Obama’s decision to deploy anti-missile systems (supposedly aimed at Iran’s non-existent nuclear weapons and actually meant to intercept Russian missiles) in Romania and Poland. Obama’s decision to invest more than of $1 trillion on an upgrade of the U.S nuclear weapons arsenal, which was already well enough stocked to blow up the world fifty times over. The upgrade involves “strategic’ bombs with smaller yields, something that dangerously blurs the lines between conventional and nuclear weapons. It has certainly helped spark a new nuclear arms race with Russia and, perhaps, China. U.S. provocation and endorsement of a right-wing 2014 coup against the pro-Russian government in Ukraine on Russia’s western border—a development that predictably created war in eastern Ukraine and created a crisis that has led to dozens of dangerous incidents between NATO and Russian forces. Washington’s self-righteous denunciation and slandering of Russia’s frankly reasonable and defensive annexation of Crimea, which was overwhelmingly supported by Crimeans as a natural response to the United States’ installation of a right-wing pro-NATO government in Kiev. If Putin’s did in fact undertake a “war” on “American democracy” (elections), this and more is all part of the “inside story” of why. Isikoff and Corn have nothing to say about this U.S.-led Western aggression. Sixth, Isikoff and Corn’s reference to Russian help as the “original sin” of Trump’s presidency is insulting to people of color, immigrants, women, and environmentalists, many of whom will quite reasonably argue that racism, nativism, sexism, and/or rapacious eco-cidalism are the true original sins of the Trump presidency. a Russian journalist’s discovery of the infamous Internet Research Agency, a Russian “troll farm” employing hundreds of Russian creating and working with fake Web identities to influence American politics. the alleged Russian Cozy Bear and Fancy Bear-Guccifer 2.0-WikiLeaks-Julian Assange hackings of the Democratic National Committee, the Clinton campaign, and the Democratic Congressional Campaign Committee in 2015 and 2016.
the infamous and creepy meeting of Donald Trump, Jr and Jared Kusher with Russian agents promising damaging information on Hillary Clinton in Trump Tower in June of 2016.
the Trump campaign’s squashing of a platform amendment that would have called for arming Ukraine in its war with Russia. the Democratic Party’s panicked, paralyzed response to the “intelligence community’s” reports that that it was under Russian cyber-assault. All that and more is treated at great and careful length in Russian Roulette. Detective and spy novel fans may especially enjoy this book. Those less experienced in reading dense mysteries may want to keep some index cards handy to keep track of all the different names and affiliations of the large and wild cast of characters that appear in Russian Roulette (which is thankfully blessed with an excellent index). This book is a dizzying blitzkrieg of American, Russian, and other actors. That raises an interesting question: if Hillary Clinton had run a better campaign and fended off the Trump-Steve Bannon-Robert Mercer-Sheldon Adelson- (and Putin/Russian?) assault in the late summer and fall of 2016, would a Clinton45 presidency now be facing Congressional inquiries into its Russian entanglements? In the meantime, anyone left or right who thinks there isn’t something strange and disturbing about Donald Trump’s relationship with Russia and Vladimir Putin has got their head in the sand no less than does somebody who thinks the United States possessed a great democracy to subvert in 2016.